Alsayed, A.M., Han, Y. and Yodh, A.G. Melting and geometric frustration in temperature-sensitive colloids in Microgel Suspensions (ed A. Fernandez-Nieves, Wyss, H.M., Mattsson, J., and Weitz, D.A.) 229-281 (Wiley-VCH, Weinheim, Germany, 2011). Basu, A., Wen, Q., Mao, X.M., Lubensky, T.C., Janmey, P.A. and Yodh, A.G. Nonaffine displacements in flexible polymer networks. Macromolecules 44, 1671-1679, doi:10.1021/ma1026803 (2011). Chen, A.B.K., Kim, S.G., Wang, Y.D., Tung, W.S. and Chen, I.W. A size-dependent nanoscale metal-insulator transition in random materials. Nat. Nanotechnol. 6, 237-241, doi:10.1038/nnano.2011.21 (2011). Chen, K., Manning, M.L., Yunker, P.J., Ellenbroek, W.G., Zhang, Z., Liu, A.J. and Yodh, A.G. Measurement of correlations between low-frequency vibrational modes and particle rearrangements in quasi-two-dimensional colloidal glasses. Phys. Rev. Lett. 107, 108301, doi:10.1103/PhysRevLett.107.108301 (2011). Chung, H.-J., Kim, J., Ohno, K. and Composto, R.J. Controlling the location of nanoparticles in polymer blends by tuning the length and end group of polymer brushes. 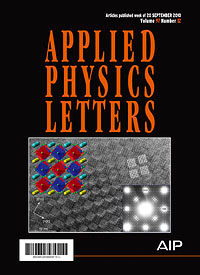 ACS Macro Letters 1, 252-256, doi:10.1021/mz200068p (2011). Ellenbroek, W.G., Wang, Y.H., Christian, D.A., Discher, D.E., Janmey, P.A. and Liu, A.J. Divalent cation-dependent formation of electrostatic PIP(2) clusters in lipid monolayers. Biophys. J. 101, 2178-2184, doi:10.1016/j.bpj.2011.09.039 (2011). Fadeev, A.Y. and DeGrado, W.F. Lipid membranes supported on optically transparent nanosilicas: Synthesis and application in characterization of protein-membrane interactions. J. Colloid Interface Sci. 355, 265-268, doi:10.1016/j.jcis.2010.11.064 (2011). Gam, S., Corlu, A., Chung, H.J., Ohno, K., Hore, M.J.A. and Composto, R.J. A jamming morphology map of polymer blend nanocomposite films. 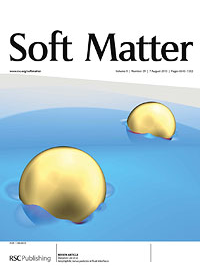 Soft Matter 7, 7262-7268, doi:10.1039/c1sm05619k (2011). Hore, M.J.A., Frischknecht, A.L. and Composto, R.J. Nanorod assemblies in polymer films and their dispersion-dependent optical properties. ACS Macro Letters 1, 115-121, doi:10.1021/mz200031g (2011). Huisman, E.M. and Lubensky, T.C. Internal stresses, normal modes, and nonaffinity in three-dimensional biopolymer networks. Phys. Rev. Lett. 106, 088301, doi:10.1103/PhysRevLett.106.088301 (2011). Kamat, N.P., Lee, M.H., Lee, D. and Hammer, D.A. Micropipette aspiration of double emulsion-templated polymersomes. 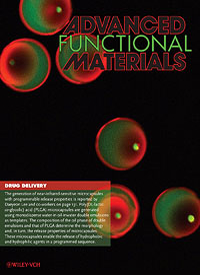 Soft Matter 7, 9863-9866, doi:10.1039/c1sm06282d (2011). Nordstrom, K.N., Gollub, J.P. and Durian, D.J. Dynamical heterogeneity in soft-particle suspensions under shear. Phys. Rev. E 84, 021403, doi:10.1103/PhysRevE.84.021403 (2011). Percec, V., Hudson, S.D., Peterca, M., Leowanawat, P., Aqad, E., Graf, R., Spiess, H.W., Zeng, X.B., Ungar, G. and Heiney, P.A. Self-repairing complex helical columns generated via kinetically controlled self-assembly of dendronized perylene bisimides. J. Am. Chem. Soc. 133, 18479-18494, doi:10.1021/ja208501d (2011). Percec, V., Peterca, M., Tadjiev, T., Zeng, X.B., Ungar, G., Leowanawat, P., Aqad, E., Imam, M.R., Rosen, B.M., Akbey, U., Graf, R., Sekharan, S., Sebastiani, D., Spiess, H.W., Heiney, P.A. and Hudson, S.D. Self-assembly of dendronized perylene bisimides into complex helical columns. J. Am. Chem. Soc. 133, 12197-12219, doi:10.1021/ja204366b (2011). Remorino, A., Korendovych, I.V., Wu, Y.B., DeGrado, W.F. and Hochstrasser, R.M. Residue-specific vibrational echoes yield 3D structures of a transmembrane helix dimer. Science 332, 1206-1209, doi:10.1126/science.1202997 (2011). Shokef, Y., Souslov, A. and Lubensky, T.C. Order by disorder in the antiferromagnetic Ising model on an elastic triangular lattice. Proc. Natl. Acad. Sci. USA 108, 11804-11809, doi:10.1073/pnas.1014915108 (2011). Verneuil, E. and Durian, D.J. Permeability of mixed soft and hard granular material: Hydrogels as drainage modifiers. Eur. Phys. J. E 34, 65, doi:10.1140/epje/i2011-11065-0 (2011). White, S.I., Vora, P.M., Kikkawa, J.M. and Winey, K.I. Resistive switching in bulk silver nanowire–polystyrene composites. Adv. Func. Mater. 21, 233-240, doi:10.1002/adfm.201001383 (2011). Wyss, H.M., Henderson, J.M., Byfield, F.J., Bruggeman, L.A., Ding, Y.X., Huang, C.F., Suh, J.H., Franke, T., Mele, E., Pollak, M.R., Miner, J.H., Janmey, P.A., Weitz, D.A. and Miller, R.T. Biophysical properties of normal and diseased renal glomeruli. Am. J. Physiol.-Cell Physiol. 300, C397-C405, doi:10.1152/ajpcell.00438.2010 (2011). Young, S.M., Chowdhury, S., Walter, E.J., Mele, E.J., Kane, C.L. and Rappe, A.M. Theoretical investigation of the evolution of the topological phase of Bi2Se3 under mechanical strain. Phys. Rev. B 84, 085106, doi:0.1103/PhysRevB.84.085106 (2011). Yunker, P.J., Chen, K., Zhang, Z.X., Ellenbroek, W.G., Liu, A.J. and Yodh, A.G. Rotational and translational phonon modes in glasses composed of ellipsoidal particles. Phys. Rev. E 83, 011403, doi:10.1103/PhysRevE.83.011403 (2011). Zhang, Z.X., Yunker, P.J., Habdas, P. and Yodh, A.G. Cooperative rearrangement regions and dynamical heterogeneities in colloidal glasses with attractive versus repulsive interactions. Phys. Rev. Lett. 107, 208303, doi:10.1103/PhysRevLett.107.208303 (2011). Badre, C., Chapel, J.P. and Yang, S. Selective dry and reversible transfer-printing of nanoparticles on top of PDMS wrinkles. 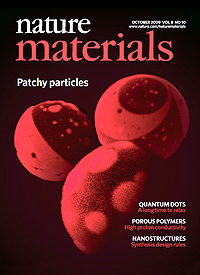 Soft Matter 7, 9886-9889, doi:10.1039/c1sm05422h (2011). Banigan, E.J., Gelbart, M.A., Gitai, Z., Wingreen, N.S. and Liu, A.J. Filament depolymerization can explain chromosome pulling during bacterial mitosis. PLoS Comput. Biol. 7, e1002145, doi:10.1371/journal.pcbi.1002145 (2011). Baumgart, T., Capraro, B.R., Zhu, C. and Das, S.L. Thermodynamics and mechanics of membrane curvature generation and sensing by proteins and lipids in Annual Review of Physical Chemistry, Vol 62 (eds S.R. Leone, P.S. Cremer, J.T. Groves & M.A. Johnson) pp 483-506 (2011). Bink, H., Lai, Y., Saudari, S.R., Helfer, J.V., Van der Spiegel, J., Litt, B. and Kagan, C. Flexible organic electronics for use in neural sensing. IEEE EMBC 2011, 5400-5403 (2011). Brugarolas, T., Park, B.J., Lee, M.H. and Lee, D. Generation of amphiphilic Janus bubbles and their behavior at an air-water interface. Adv. Funct. Mater. 21, 3924-3931, doi:10.1002/adfm.201100954 (2011). Carpick, R.W., Jacobs, T.D.B., Liu, X.Z. and Li, Q. Geometrical effects in contact mechanics: From atomic membranes to evolving asperities. ICFD 2011 Proceedings (2011). Castagna, A.M., Wang, W.Q., Winey, K.I. and Runt, J. Influence of cation type on structure and dynamics in sulfonated polystyrene ionomers. Macromolecules 44, 5420-5426, doi:10.1021/ma2009657 (2011). Choi, B.J., Chen, A.B.K., Yang, X. and Chen, I.W. Purely electronic switching with high uniformity, resistance tunability, and good retention in Pt-dispersed SiO2 thin films for ReRAM. Adv. Mater. 23, 3847-+, doi:10.1002/adma.201102132 (2011). Dong, A.G., Chen, J., Oh, S.J., Koh, W.K., Xiu, F.X., Ye, X.C., Ko, D.K., Wang, K.L., Kagan, C.R. and Murray, C.B. Multiscale periodic assembly of striped nanocrystal super lattice films on a liquid surface. Nano Lett. 11, 841-846, doi:10.1021/nl104208x (2011). Dong, A.G., Chen, J., Ye, X.C., Kikkawa, J.M. and Murray, C.B. Enhanced thermal stability and magnetic properties in NaCl-Type FePt-MnO binary nanocrystal superlattices. J. Am. Chem. Soc. 133, 13296-13299, doi:10.1021/ja2057314 (2011). Dong, A.G., Ye, X.C., Chen, J., Kang, Y.J., Gordon, T., Kikkawa, J.M. and Murray, C.B. A generalized ligand-exchange strategy enabling sequential surface functionalization of colloidal nanocrystals. J. Am. Chem. Soc. 133, 998-1006, doi:10.1021/ja108948z (2011). Friedrich, B.M., Buxboim, A., Discher, D.E. and Safran, S.A. Striated acto-myosin fibers can reorganize and register in response to elastic interactions with the matrix. Biophys. J. 100, 2706-2715, doi:10.1016/j.bpj.2011.04.050 (2011). Gam, S., Meth, J.S., Zane, S.G., Chi, C.Z., Wood, B.A., Seitz, M.E., Winey, K.I., Clarke, N. and Composto, R.J. Macromolecular diffusion in a crowded polymer nanocomposite. Macromolecules 44, 3494-3501, doi:10.1021/ma102463q (2011). Grigoryan, G., Kim, Y.H., Acharya, R., Axelrod, K., Jain, R.M., Willis, L., Drndic, M., Kikkawa, J.M. and DeGrado, W.F. Computational design of virus-like protein assemblies on carbon nanotube surfaces. Science 332, 1071-1076, doi:10.1126/science.1198841 (2011). Guo, L., Smith-Dupont, K.B. and Gai, F. Diffusion as a probe of peptide-induced membrane domain formation. 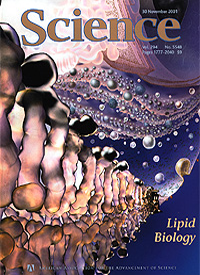 Biochemistry 50, 2291-2297, doi:10.1021/bi102068j (2011). Gupta, S., Liu, J., Strzalka, J. and Blasie, J.K. Profile structures of the voltage-sensor domain and the voltage-gated K+-channel vectorially oriented in a single phospholipid bilayer membrane at the solid-vapor and solid-liquid interfaces determined by x-ray interferometry. Phys. Rev. E 84, 031911, doi:10.1103/PhysRevE.84.031911 (2011). Haun, J.B., Pepper, L.R., Boder, E.T. and Hammer, D.A. Using engineered single-chain antibodies to correlate molecular binding properties and nanoparticle adhesion dynamics. Langmuir 27, 13701-13712, doi:10.1021/la202926m (2011). Haxton, T.K., Schmiedeberg, M. and Liu, A.J. Universal jamming phase diagram in the hard-sphere limit. Phys. Rev. E 83, 031503, doi:10.1103/PhysRevE.83.031503 (2011). Hickey, R.J., Haynes, A.S., Kikkawa, J.M. and Park, S.J. Controlling the self-assembly structure of magnetic nanoparticles and amphiphilic block-copolymers: From micelles to vesicles. J. Am. Chem. Soc. 133, 1517-1525, doi:10.1021/ja1090113 (2011). Hiesinger, W., Perez-Aguilar, J.M., Atluri, P., Marotta, N.A., Frederick, J.R., Fitzpatrick, J.R., McCormick, R.C., Muenzer, J.R., Yang, E.C., Levit, R.D., Yuan, L.J., MacArthur, J.W., Saven, J.G. and Woo, Y.J. Computational protein design to reengineer stromal cell-derived factor-1α generates an effective and translatable angiogenic polypeptide analog. Circulation 124, S18-S26, doi:10.1161/circulationaha.110.009431 (2011). Hribar, K.C., Lee, M.H., Lee, D. and Burdick, J.A. Enhanced release of small molecules from near-infrared light responsive polymer−nanorod composites. ACS Nano, null-null, doi:10.1021/nn103575a (2011). Huang, L., Li, Q.J., Shan, Z.W., Li, J., Sun, J. and Ma, E. A new regime for mechanical annealing and strong sample-size strengthening in body centred cubic molybdenum. Nat. Commun. 2, 547, doi:10.1038/ncomms1557 (2011). Jilek, R.E., Spencer, L.P., Kuiper, D.L., Scott, B.L., Williams, U.J., Kikkawa, J.M., Schelter, E.J. and Boncella, J.M. A general and modular synthesis of monoimidouranium(IV) dihalides. Inorganic Chemistry 50, 4235-4237, doi:10.1021/ic200377b (2011). Jin, C.R., Khare, K., Vajpayee, S., Yang, S., Jagota, A. and Hui, C.Y. Adhesive contact between a rippled elastic surface and a rigid spherical indenter: from partial to full contact. 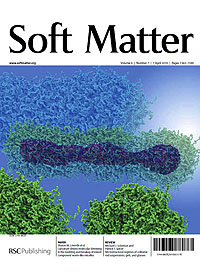 Soft Matter 7, 10728-10736, doi:10.1039/c1sm06367g (2011). Jung, Y., Agarwal, R. and Yang, C.Y. Chalcogenide phase-change memory nanotubes for lower writing current operation. 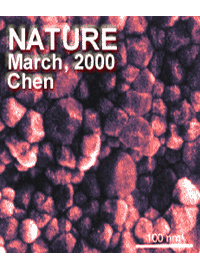 Nanotechnology 22, 254012, doi:10.1088/0957-4484/22/25/254012 (2011). Jung, Y., Nam, S.W. and Agarwal, R. High resolution transmission electron microscopy study of electrically-driven phase change phenomena in Ge2Sb2Te5 nanowires. Nano Lett. 11, 1364-1368, doi:10.1021/nl104537c (2011). Kamat, N.P., Katz, J.S. and Hammer, D.A. Engineering polymersome protocells. J. Phys. Chem. Lett. 2, 1612-1623, doi:10.1021/jz200640x (2011). Kamat, N.P., Liao, Z.Z., Moses, L.E., Rawson, J., Therien, M.J., Dmochowski, I.J. and Hammer, D.A. Sensing membrane stress with near IR-emissive porphyrins. Proc. Natl. Acad. Sci. USA 108, 13984-13989, doi:10.1073/pnas.1102125108 (2011). Kim, J.S., Lee, S., Gorte, R.J. and Vohs, J.M. Substrate-mediated spreading and phase segregation at LSM-Zirconia interfaces. J. Electrochem. Soc. 158, B79-B83, doi:10.1149/1.3507286 (2011). Kim, S.-W., Kim, S.-G., Jung, J.-I., Kang, S.-J.L. and Chen, I.-W. Enhanced grain boundary mobility in Yttria-stabilized cubic Zirconia under an electric current. J. Amer. Ceram. Soc. 94, 4231-4238 (2011). Kim, Y.H., Donald, J.E., Grigoryan, G., Leser, G.P., Fadeev, A.Y., Lamb, R.A. and DeGrado, W.F. Capture and imaging of a prehairpin fusion intermediate of the paramyxovirus PIV5. Proc. Natl. Acad. Sci. USA 108, 20992-20997, doi:10.1073/pnas.1116034108 (2011). Ko, D.K., Kang, Y.J. and Murray, C.B. Enhanced thermopower via carrier energy filtering in solution-processable Pt-Sb2Te3 nanocomposites. Nano Lett. 11, 2841-2844, doi:10.1021/nl2012246 (2011). Ko, D.K. and Murray, C.B. Probing the Fermi energy level and the density of states distribution in PbTe nanocrystal (Quantum Dot) solids by temperature-dependent thermopower measurements. ACS Nano 5, 4810-4817, doi:10.1021/nn2007817 (2011). Koh, W.K., Saudari, S.R., Fafarman, A.T., Kagan, C.R. and Murray, C.B. Thiocyanate-capped PbS nanocubes: ambipolar transport enables quantum dot based circuits on a flexible substrate. Nano Lett. 11, 4764-4767, doi:10.1021/nl202578g (2011). Korendovych, I.V., Shandler, S.J., Montalvo, G.L. and DeGrado, W.F. Environment- and sequence-dependence of helical type in membrane-spanning peptides composed of b3-amino acids. Org. Lett. 13, 3474-3477, doi:10.1021/ol201218y (2011). Kraft, S.J., Williams, U.J., Daly, S.R., Schelter, E.J., Kozimor, S.A., Boland, K.S., Kikkawa, J.M., Forrest, W.P., Christensen, C.N., Schwarz, D.E., Fanwick, P.E., Clark, D.L., Conradson, S.D. and Bart, S.C. Synthesis, characterization, and multielectron reduction chemistry of uranium supported by redox-active a-diimine ligands. 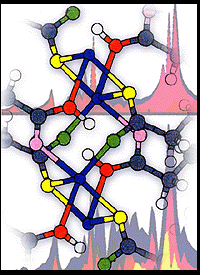 Inorganic Chemistry 50, 9838-9848, doi:10.1021/ic2002805 (2011). Krieger, C.C., An, X.L., Tang, H.Y., Mohandas, N., Speicher, D.W. and Discher, D.E. Cysteine shotgun-mass spectrometry (CS-MS) reveals dynamic sequence of protein structure changes within mutant and stressed cells. Proc. Natl. Acad. Sci. USA 108, 8269-8274, doi:10.1073/pnas.1018887108 (2011). Kushima, A., Eapen, J., Li, J., Yip, S. and Zhu, T. Time scale bridging in atomistic simulation of slow dynamics: viscous relaxation and defect activation. Eur. Phys. J. B 82, 271-293, doi:10.1140/epjb/e2011-20075-4 (2011). Kushima, A., Liu, X.H., Zhu, G., Wang, Z.L., Huang, J.Y. and Li, J. Leapfrog cracking and nanoamorphization of ZnO nanowires during in situ electrochemical lithiation. Nano Lett. 11, 4535-4541, doi:10.1021/nl201376j (2011). Lee, H.-S., Eckmann, D.M., Lee, D., Hickok, N.J. and Composto, R.J. Symmetric pH-dependent swelling and antibacterial properties of chitosan brushes. Langmuir 27, 12458-12465, doi:10.1021/la202616u (2011). Lee, M., Choi, U.H., Salas-de la Cruz, D., Mittal, A., Winey, K.I., Colby, R.H. and Gibson, H.W. Imidazolium polyesters: Structure-property relationships in thermal behavior, ionic conductivity, and morphology. Adv. Funct. Mater. 21, 708-717, doi:10.1002/adfm.201001878 (2011). Lewis, A.J., Williams, U.J., Kikkawa, J.M., Carroll, P.J. and Schelter, E.J. Uranium pyrrolylamine complexes featuring a trigonal binding pocket and interligand noncovalent interactions. Inorganic Chemistry 51, 37-39, doi:10.1021/ic202411f (2011). Li, J., Sarkar, S., Cox, W.T., Lenosky, T.J., Bitzek, E. and Wang, Y.Z. Diffusive molecular dynamics and its application to nanoindentation and sintering. Phys. Rev. B 84, 054103, doi:10.1103/PhysRevB.84.054103 (2011). Liu, J., Bradley, R.P., Eckmann, D.M., Ayyaswamy, P.S. and Radhakrishnan, R. Multiscale modeling of functionalized nanocarriers in targeted drug delivery. Current Nanoscience 7, 727-735 (2011). Liu, Y.W., Ko, D.K., Oh, S.J., Gordon, T.R., Vicky, D.N., Paik, T., Kang, Y.J., Ye, X.C., Jin, L.H., Kagan, C.R. and Murray, C.B. Near-infrared absorption of monodisperse silver telluride (Ag(2)Te) nanocrystals and photoconductive response of their self-assembled superlattices. Chem. Mat. 23, 4657-4659, doi:10.1021/cm2019795 (2011). Loverde, S.M., Klein, M.L. and Discher, D.E. Nanoparticle shape improves delivery: Rational coarse grain molecular dynamics (rCG-MD) of taxol in worm-like PEG-PCL micelles. Adv. Mat., 24, 3823-3830, doi:10.1002/adma.201103192 (2011). Loverde, S.M., Pantano, D.A., Christian, D.A., Mahmud, A., Klein, M.L. and Discher, D.E. Curvature, rigidity, and pattern formation in functional polymer micelles and vesicles – From dynamic visualization to molecular simulation. Curr. Opin. Solid State Mat. Sci. – Current Opinion in Solid State & Materials Science 15, 277-284, doi:10.1016/j.cossms.2011.06.003 (2011). Mensa, B., Kim, Y.H., Choi, S., Scott, R., Caputo, G.A. and DeGrado, W.F. Antibacterial mechanism of action of arylamide foldamers. Antimicrobial Agents and Chemotherapy 55, 5043-5053, doi:10.1128/aac.05009-11 (2011). Moldovan, N., Dai, Z., Carlisle, J.A., Jacobs, T.D.B., Vahdat, V., Grierson, D.S., Liu, J., Turner, K.T. and Carpick, R.W. Advances in manufacturing of molded tips for scanning probe microscop. J. Microelectromech. Sys., 99, 1-12 (2011). Nguyen, N.H. and Percec, V. SET-LRP of methyl acrylate catalyzed with activated Cu(0) wire in methanol in the presence of air. J. Polymer Sci. Part a-Polymer Chem. 49, 4756-4765, doi:10.1002/pola.24922 (2011). Nguyen, N.H. and Percec, V. Disproportionating versus nondisproportionating solvent effect in the SET-LRP of methyl acrylate during catalysis with nonactivated and activated Cu(0) wire. J. Polymer Sci. Part a-Polymer Chem. 49, 4227-4240, doi:10.1002/pola.24865 (2011). Nguyen, N.H. and Percec, V. Acid dissolution of copper oxides as a method for the activation of Cu(0) wire catalyst for SET-LRP. J. Polymer Sci. Part a-Polymer Chem. 49, 4241-4252, doi:10.1002/pola.24866 (2011). Nguyen, N.H., Rosen, B.M. and Percec, V. Improving the initiation efficiency in the single electron transfer living radical polymerization of methyl acrylate with electronic chain-end mimics. J. Polym. Sci. Pol. Chem. 49, 1235-1247, doi:10.1002/pola.24543 (2011). Nucci, N.V., Pometun, M.S. and Wand, A.J. Site-resolved measurement of water-protein interactions by solution NMR. Nat. Struct. Mol. Biol. 18, 245-U315, doi:10.1038/nsmb.1955 (2011). Paik, T., Ko, D.K., Gordon, T.R., Doan-Nguyen, V. and Murray, C.B. Studies of liquid crystalline self-assembly of GdF(3) nanoplates by in-plane, out-of-plane SAXS. ACS Nano 5, 8322-8330, doi:10.1021/nn203049t (2011). Pantano, D.A., Klein, M.L., Discher, D.E. and Moore, P.B. Morphologies of charged diblock copolymers simulated with a neutral coarse-grained model. J. Phys. Chem. B 115, 4689-4695, doi:10.1021/jp201085c (2011). Pantano, D.A., Moore, P.B., Klein, M.L. and Discher, D.E. Raft registration across bilayers in a molecularly detailed model. 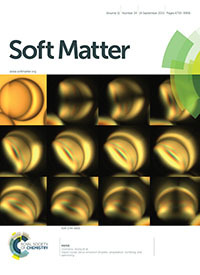 Soft Matter 7, 8182-8191, doi:10.1039/c1sm05490b (2011). Peng, Y., Wang, Z.-R., Alsayed, A.M., Yodh, A.G. and Han, Y. Melting of multilayer colloidal crystals confined between two walls. Phys. Rev. E 83, 011404, doi:10.1103/PhysRevE.83.011404 (2011). Percec, V. and Leowanawat, P. Why are biological systems homochiral? Israel J. Chem. 51, 1107-1117, doi:10.1002/ijch.201100152 (2011). Peterca, M., Imam, M.R., Ahn, C.H., Balagurusamy, V.S.K., Wilson, D.A., Rosen, B.M. and Percec, V. Transfer, amplification, and inversion of helical chirality mediated by concerted interactions of C-3-supramolecular dendrimers. J. Am. Chem. Soc. 133, 2311-2328, doi:10.1021/ja110753s (2011). Peterca, M., Percec, V., Leowanawat, P. and Bertin, A. Predicting the size and properties of dendrimersomes from the lamellar structure of their amphiphilic Janus dendrimers. J. Am. Chem. Soc. 133, 20507-20520, doi:10.1021/ja208762u (2011). Ramanan, V., Agrawal, N.J., Liu, J., Engles, S., Toy, R. and Radhakrishnan, R. Systems biology and physical biology of clathrin-mediated endocytosis. Integr. Biol. 3, 803-815, doi:10.1039/c1ib00036e (2011). Ramanan, V.V., Hribar, K.C., Katz, J.S. and Burdick, J.A. Nanofiber-nanorod composites exhibiting light-induced reversible lower critical solution temperature transitions. Nanotechnology 22, 494009, doi:10.1088/0957-4484/22/49/494009 (2011). Rogers, J.M.G., Poishchuk, A.L., Guo, L., Wang, J., DeGrado, W.F. and Gai, F. Photoinduced electron transfer and fluorophore motion as a probe of the conformational dynamics of membrane proteins: Application to the influenza A M2 proton channel. 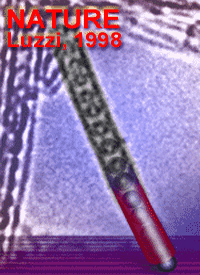 Langmuir 27, 3815-3821, doi:10.1021/la200480d (2011). Rogers, W.B. and Crocker, J.C. Direct measurements of DNA-mediated colloidal interactions and their quantitative modeling. Proc. Natl. Acad. Sci. USA 108, 15687-15692, doi:10.1073/pnas.1109853108 (2011). Rosen, B.M., Quasdorf, K.W., Wilson, D.A., Zhang, N., Resmerita, A.M., Garg, N.K. and Percec, V. Nickel-catalyzed cross-couplings involving carbon-oxygen bonds. Chem. Rev. 111, 1346-1416, doi:10.1021/cr100259t (2011). Samish, I., MacDermaid, C.M., Perez-Aguilar, J.M. and Saven, J.G. Theoretical and computational protein design in Annual Review of Physical Chemistry, Vol 62 (eds. S.R. Leone, P.S. Cremer, J.T. Groves & M.A. Johnson) pp. 129-149 (2011). Sanchez-Gaytan, B.L., Li, S., Kamps, A.C., Hickey, R.J., Clarke, N., Fryd, M., Wayland, B.B. and Park, S.-J. Controlling the radial position of nanoparticles in amphiphilic block-copolymer assemblies. J. Phys. Chem. C 115, 7836-7842, doi:10.1021/jp1087543 (2011). Saven, J.G. Computational protein design: engineering molecular diversity, nonnatural enzymes, nonbiological cofactor complexes, and membrane proteins. Curr. Opin. Chem. Biol. 15, 452-457, doi:10.1016/j.cpa.2011.03.014 (2011). Scarlett, R.T., Ung, M.T., Crocker, J.C. and Sinno, T. A mechanistic view of binary colloidal superlattice formation using DNA-directed interactions. 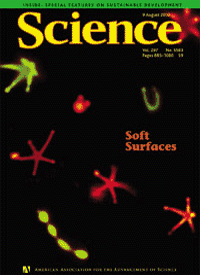 Soft Matter 7, 1912-1925, doi:10.1039/c0sm00370k (2011). Schmiedeberg, M., Haxton, T.K., Nagel, S.R. and Liu, A.J. Mapping the glassy dynamics of soft spheres onto hard-sphere behavior. EPL 96, 36010, doi:10.1209/0295-5075/96/36010 (2011). Shandler, S.J., Korendovych, I.V., Moore, D.T., Smith-Dupont, K.B., Streu, C.N., Litvinov, R.I., Billings, P.C., Gai, F., Bennett, J.S. and DeGrado, W.F. Computational design of a beta-peptide that targets transmembrane helices. J. Am. Chem. Soc. 133, 12378-12381, doi:10.1021/ja204215f (2011). Soto, C.S., Hannigan, B.T. and DeGrado, W.F. A photon-free approach to transmembrane protein structure determination. J. Mol. Biol. 414, 596-610, doi:10.1016/j.jmb.2011.10.016 (2011). Susumu, K., Fisher, J., Zheng, J., Beratan, D., Yodh, A.G. and Therien, M. Two-photon absorption properties of proquinoidal D-A-D and A-D-A quadrupolar chromophores. J. Phys. Chem. A, 115, 5525-5539, doi:10.1021/jp2000738 (2011). Tee, S.-Y., Fu, J., Chen, C.S. and Janmey, P.A. Cell shape and substrate rigidity both regulate cell stiffness. Biophys. J. 100, L25-L27, doi:DOI: 10.1016/j.bpj.2010.12.3744 (2011). Tettey, K.E., Dafinone, M.I. and Lee, D. Progress in superhydrophilic surface development. Materials Express 1, 89-104, doi:10.1166/mex.2011.1021 (2011). Tettey, K.E., Ho, J.W.C. and Lee, D. Modulating layer-by-layer assembly of oppositely charged nanoparticles using a short amphiphilic molecule. J. Phys. Chem. C 115, 6297-6304, doi:10.1021/jp112386n (2011). Tong, W., Huang, F.-Q. and Chen, I.-W. Electron localization and magnetism in SrRuO3 with non-magnetic cation substitution. J. Phys. : Condens. Matter 23, 086005, doi:10.1088/0953-8984/23/8/086005 (2011). Uma, B., Swaminathan, T.N., Radhakrishnan, R., Eckmann, D.M. and Ayyaswamy, P.S. Nanoparticle Brownian motion and hydrodynamic interactions in the presence of flow fields. Phys. Fluids 23, 073602, doi:10.1063/1.3611026 (2011). Ungar, G., Percec, V., Zeng, X.B. and Leowanawat, P. Liquid quasicrystals. Israel J. Chem. 51, 1206-1215, doi:10.1002/ijch.201100151 (2011). Vahdat, V., Grierson, S.D., Turner, K.T. and Carpick, R.W. Nano-scale forces, stresses, and tip geometry evolution of amplitude modulation atomic force microscopy probes. ASME Conf. Proc. 2011, DETC2011-48653 (2011). Vajpayee, S., Khare, K., Yang, S., Hui, C.-Y. and Jagota, A. Adhesion selectivity using rippled surfaces. Adv. Funct. Mater. 21, 547-555, doi:10.1002/adfm.201001652 (2011). Wang, S.Y., Querner, C., Dadosh, T., Crouch, C.H., Novikov, D.S. and Drndic, M. Collective fluorescence enhancement in nanoparticle clusters. Nat. Commun. 2, 364, doi:10.1038/ncomms1357 (2011). West, D.V. and Davies, P.K. Triclinic and monoclinic structures of SrLaCuNbO6 and SrLaCuTaO6 double perovskites. J. Appl. Crystallogr. 44, 595-602, doi:10.1107/s0021889811012131 (2011). Yang, M.T., Fu, J., Wang, Y.-K., Desai, R.A. and Chen, C.S. Assaying stem cell mechanobiology on microfabricated elastomeric substrates with geometrically modulated rigidity. Nat. Protocols 6, 187-213, doi:10.1038/nprot.2010.189 (2011). Yoo, J.W., Irvine, D.J., Discher, D.E. and Mitragotri, S. Bio-inspired, bioengineered and biomimetic drug delivery carriers. Nat. Rev. Drug Discov. 10, 521-535, doi:10.1038/nrd3499 (2011). Yunker, P.J., Chen, K., Zhang, Z.X. and Yodh, A.G. Phonon spectra, nearest neighbors, and mechanical stability of disordered colloidal clusters with attractive interactions. Phys. Rev. Lett. 106, 225503, doi:10.1103/PhysRevLett.106.225503 (2011). Yunker, P.J., Still, T., Lohr, M.A. and Yodh, A.G. Suppression of the coffee-ring effect by shape-dependent capillary interactions. 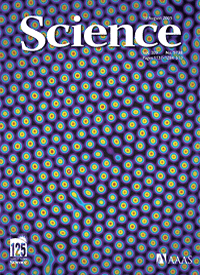 Nature 476, 308-311, doi:10.1038/nature10344 (2011). Adiga, S.P., Adiga, V.P., Carpick, R.W. and Brenner, D.W. Vibrational properties and specific heat of ultrananocrystalline diamond: Molecular dynamics simulations. J. Phys. Chem. C 115, 21691-21699, doi:10.1021/jp207424m (2011). Buitrago, C.F., Opper, K.L., Wagener, K.B. and Winey, K.I. Precise acid copolymer exhibits a face-centered cubic structure. 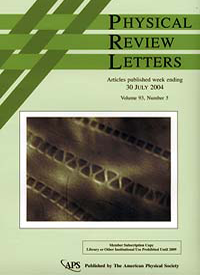 ACS Macro Letters 1, 71-74, doi:10.1021/mz2000237 (2011). Castagna, A.M., Wang, W.Q., Winey, K.I. and Runt, J. Structure and dynamics of zinc-neutralized sulfonated polystyrene ionomers. 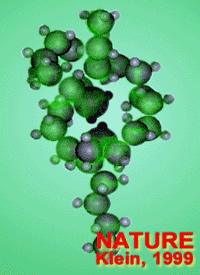 Macromolecules 44, 2791-2798, doi:10.1021/ma2001614 (2011). Cavallaro, M., Botto, L., Lewandowski, E.P., Wang, M. and Stebe, K.J. Curvature-driven capillary migration and assembly of rod-like particles. Proc. Natl. Acad. Sci. USA. 108, 20923-20928, doi:10.1073/pnas.1116344108 (2011). Chan, C.D., Seitz, M.E. and Winey, K.I. Disordered spheres with extensive overlap in projection: Image simulation and analysis. Microsc. Microanal. 17, 872-878, doi:10.1017/s1431927611012190 (2011). Davis, E.M., Benetatos, N.M., Regnault, W.F., Winey, K.I. and Elabd, Y.A. The influence of thermal history on structure and water transport in Parylene C coatings. Polymer 52, 5378-5386, doi:10.1016/j.polymer.2011.08.010 (2011). Green, M.D., Allen Jr, M.H., Dennis, J.M., Cruz, D.S.-d.l., Gao, R., Winey, K.I. and Long, T.E. Tailoring macromolecular architecture with imidazole functionality: A perspective for controlled polymerization processes. Eur. Poly. J. 47, 486-496, doi:DOI: 10.1016/j.eurpolymj.2010.09.035 (2011). Green, M.D., Salas-de la Cruz, D., Ye, Y.S., Layman, J.M., Elabd, Y.A., Winey, K.I. and Long, T.E. Alkyl-substituted N-vinylimidazolium polymerized ionic liquids: Thermal properties and ionic conductivities. Macromol. Chem. Phys. 212, 2522-2528, doi:10.1002/macp.201100389 (2011). Hall, L.M., Seitz, M.E., Winey, K.I., Opper, K.L., Wagener, K.B., Stevens, M.J. and Frischknecht, A.L. Ionic aggregate structure in ionomer melts: Effect of molecular architecture on aggregates and the ionomer peak. J. Am. Chem. Soc. 134, 574-587, doi:10.1021/ja209142b (2011). Ishizuka, T., Sinks, L.E., Song, K., Hung, S.-T., Nayak, A., Clays, K. and Therien, M.J. The roles of molecular structure and effective optical symmetry in evolving dipolar chromophoric building blocks to potent octopolar nonlinear optical chromophores. J. Am. Chem. Soc. 133, 2884-2896, doi:10.1021/ja105004k (2011). Kang, Y.K., Iovine, P.M. and Therien, M.J. Electron transfer reactions of rigid, cofacially compressed, p-stacked porphyrin-bridge-quinone systems. Coord. Chem. Rev. 255, 804-824, doi:10.1016/j.ccr.2010.12.011 (2011). Karunakaran, R.G., Lu, C.H., Zhang, Z.H. and Yang, S. Highly transparent superhydrophobic surfaces from the coassembly of nanoparticles (< 100 nm). Langmuir 27, 4594-4602, doi:10.1021/la104067c (2011). Kim, J.S., Wieder, N.L., Abraham, A.J., Cargnello, M., Fornasiero, P., Gorte, R.J. and Vohs, J.M. Highly Active and Thermally Stable Core-Shell Catalysts for Solid Oxide Fuel Cells. J. Electrochem. Soc. 158, B596-B600, doi:10.1149/1.3571039 (2011). Kungas, R., Kim, J.S., Vohs, J.M. and Gorte, R.J. Restructuring porous YSZ by treatment in hydrofluoric acid for use in SOFC cathodes. J. Am. Ceram. Soc. 94, 2220-2224, doi:10.1111/j.1551-2916.2010.04359.x (2011). Mu, M.F., Seitz, M.E., Clarke, N., Composto, R.J. and Winey, K.I. Polymer tracer diffusion exhibits a minimum in nanocomposites containing spherical nanoparticles. Macromolecules 44, 191-193, doi:10.1021/ma1019818 (2011). Wang, W.Q., Tudryn, G.J., Colby, R.H. and Winey, K.I. Thermally driven Ionic aggregation in poly(ethylene oxide)-based sulfonate ionomers. J. Am. Chem. Soc. 133, 10826-10831, doi:10.1021/ja201405v (2011).